What a truly momentous day! Eden is incredibly proud to have supported the successful bid team for Nottingham City of Football throughout the final assessment visit by Sport England and announcement of the decision today. A whirlwind of a day … managing media interviews and a huge level of interest from both local and national press with a social media programme that went stratospheric from launch. (If you haven’t already, then you really must … @NottinghamCOF #NottmCOF). 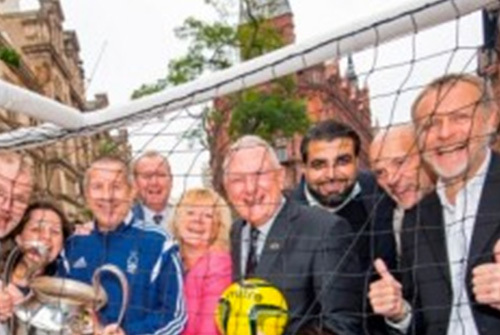 So it’s official, Sport England has named Nottingham as England’s first City of Football. Impressive is exactly right. The Bid Team brought together organisations across Nottingham’s digital, technology and creative industries, as well as its business, voluntary, community and football sectors to create an unbeatable proposal which intends to engage with young people through youth culture; including music, fashion, gaming, film and art. Combining these creative strengths with Nottingham’s track record of delivering sports initiatives helped secure victory ahead of Manchester and Portsmouth. Keep your eye on this campaign – there are some unique ideas and plans still to be revealed.